On the east side of the Scioto River and just south of Interstate 70 is a strip of land called the Whittier Street Peninsula. 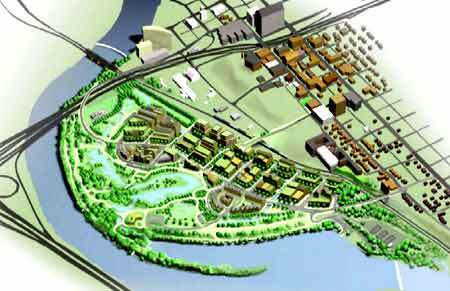 Currently this area is mostly being used as an industrial area, but plans are underway to develop this riverfront area into 200,000 sq. ft. of commercial and retail use, integration of residential living areas, park settings and a golf course, with a possible canal system waterway and wetland areas where there will be an Audubon Center for bird studies. 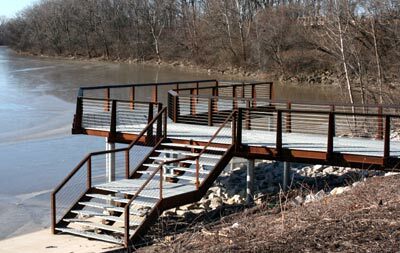 This area is currently undergoing redevelopment, but the New Metro Park, while not officially open and is still under development, visitors can fish and hike some of the trails already constructed. The state’s first urban Audubon Nature Center is being built on the Whittier Peninsula and is set to open in 2008. This site which is being jointly developed by Audubon Ohio, Columbus Parks and Recreation and the Franklin Metro Park District, will feature critical habitat for which has been designated an Important Bird Area of critical habitat for migrating birds in an urban environment. The most exciting element in the Audubon Center project is the opportunity to build within the new downtown community. It will be in some respects similar to the Aulwood Center located near Dayton.